International journal “Programmnye produkty i sistemy” (Software & Systems) has been published since 1988. Journal founders: International Research Institute of Control Sciences (Moscow), Chief editorial board of the International journal “The Issues of Management Theory and Practice” (Moscow), Research Institute “Centerprogramsystem” (Tver). The publisher of the journal is Research Institute “Centerprogramsystem”. The journal is registered in State Press Committee of the Russian Federation on June 26, 1995. A registration certificate No. 013831. An international editorial board consists of well-known scientists and experts from Belarus, Bulgaria, Vietnam, Mexico, Poland, Russia, the USA, Ukraine and Finland. “Programmnye produkty i sistemy" (Software & Systems) contributes to the synthesis and extension of experience in computer science, software development and application. The journal introduces the works of scientists and specialists from Russia and foreign countries, gives answers to practical questions related to using computer technologies, analyzes trends and predicts program and technical means development. An open access policy considering scientific publications increases citing of our authors’ papers and improves their scientific performance. · integration of Russian scientists to the international scientific community and sharing experiences between world scientists. · adding the journal to international databases and citation bases. The title is useful for PC users, programmers, design engineers and developers in different areas of human activity. According to the order of the Ministry of Education and Science of the Russian Federation there is a List of leading peer-reviewed scientific publications for publishing basic scientific results of doctoral and candidate’s thesis (a letter on the List of leading peer-reviewed scientific publications No. 13-6518 under date of December the 1st, 2015). The international journal “Programmnye Produkty i Sistemy” (Software & Systems) is in this List, no. 1672. A paper is acceptable for submission if it has not been published before. The content should be relevant to the journal topics (specialties: computer science, IT-equipment and control, mathematics, mechanics, astronomy, physics) and meet editorial board requirements. Author manuscripts are supposed to be sent for peer review process. Reviewers are the members of an international editorial board of the journal “Programmnye produkty i sistemy” (Software & Systems). They are famous Moscow scientists (Moscow State University, Moscow Power Engineering Institute, Bauman Moscow State Technical University, D. Mendeleyev University of Chemical Technology of Russia, Institute of Control Sciences of RAS, National Research University of Electronic Technology (MIET)), Kiev scientists (Glushkov Institute of Cybernetics (GIC)), Taganrog scientists (Taganrog Radio Engineering University), Tver scientists (Tver State University, Tver State Technical University, Research Institute “Centerprogramsystem”), St. Petersburg scientists (St. Petersburg Institute for Informatics and Automation of RAS), Kazan scientists (Kazan State Technical University) and others. After the article has been approved by the editorial board, it will be published free of charge within a year. There is an application form for authors. Publication is free for postgraduates if a postgraduate is a sole author and has a study certificate. The journal is registered in the database of the International Ulrich's Periodicals Directory (http://www.ulrichsweb.com). 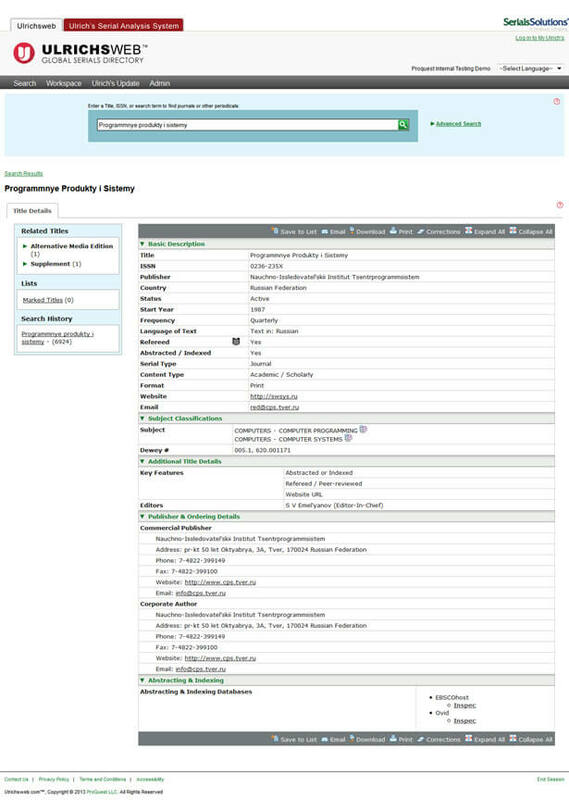 The screenshot from the database Ulrich's Periodicals Directory. Information about published articles is submitted regularly to the scientific electronic library http://elibrary.ru to the Russian index of scientific citation (RINTs).